As I hoped to deliver and my request was granted by the Allmighty, I don't know of a better weather day in Kansas. I planned for a solo ride maybe a few others near by. The response and turnout was just fabtabulous. I can't thank everyone enough for giving me the pleasure of meeting, riding and knowing you. 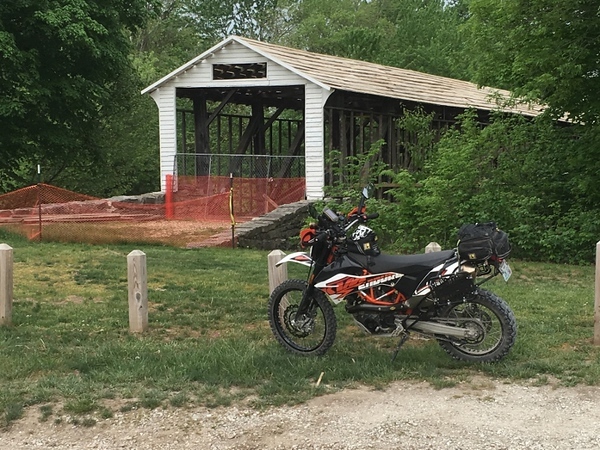 Phil Denk, KLR650, Kansas City Mo: Greg Mitchell,KTM 950 Adv Beast, Emporia Ks. 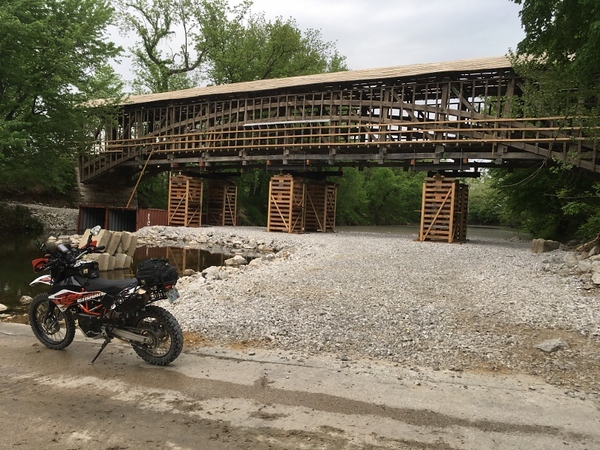 Those are the waivers I have, I think I am missing Alex from KC on his Kaway 300, and Benson who joined us at lunch on his KLR 650 and is now enjoying the crickets at Reading Lake! Numbers say I am missing one if anyone can fill in the last would be great. Four trailered or trucked into Emporia with 5 bikes. Greg and Phil met us there. 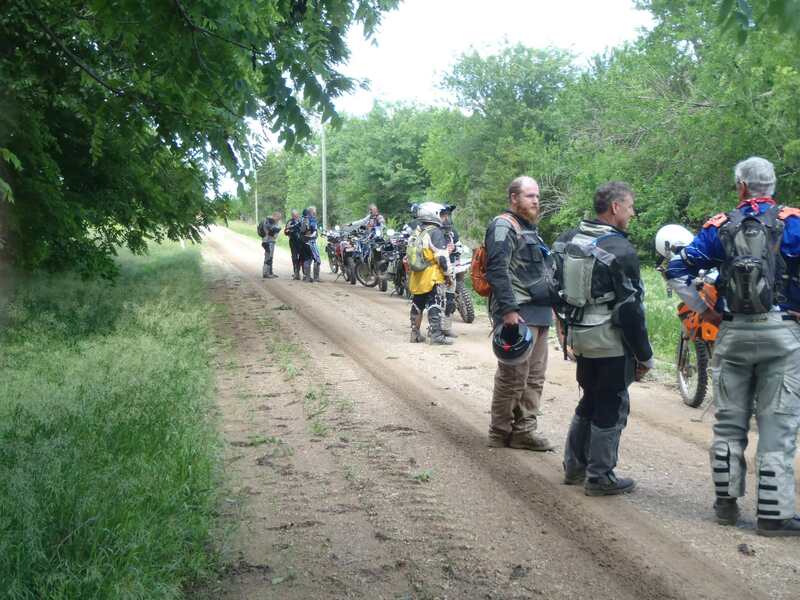 Had intros and all then headed for Olpe. 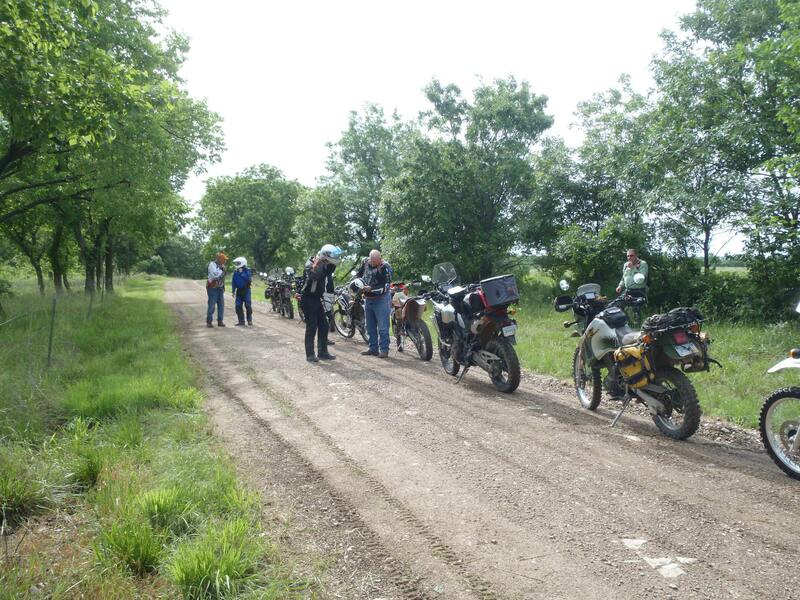 Arrived in Olpe around 9 where we found 10 others for a total group of 17. 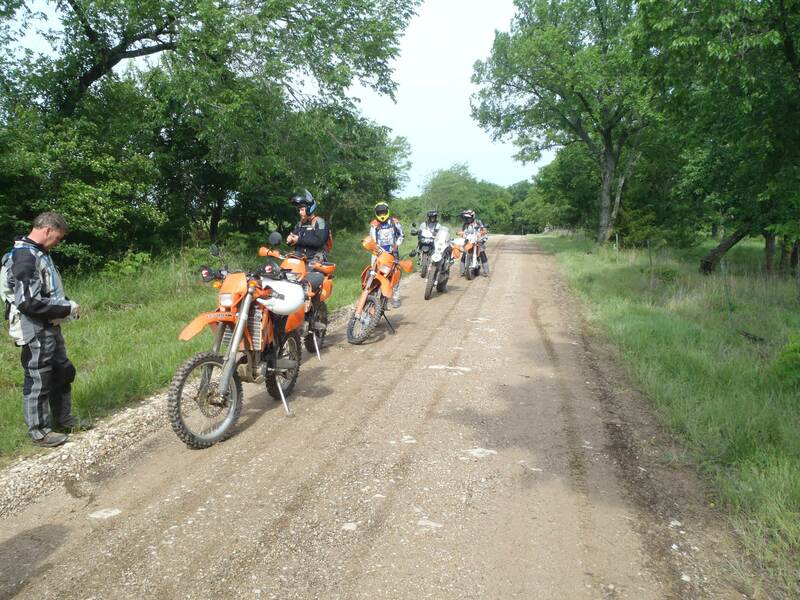 Rounded up the kickstands just after 9:30 and headed west then south to the Verdegris River Valley. 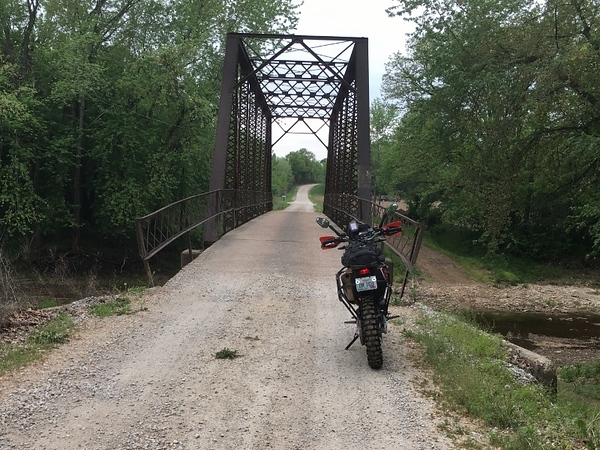 I opted out of the deep water crossing over the North fork mainly due to the size of the group and I have not done it on two wheels. Took the low water bridge over the North fork up over the ridge and down to the South fork. Back west to the oil fields and up to what I call, "If my house were here I could see Russia". 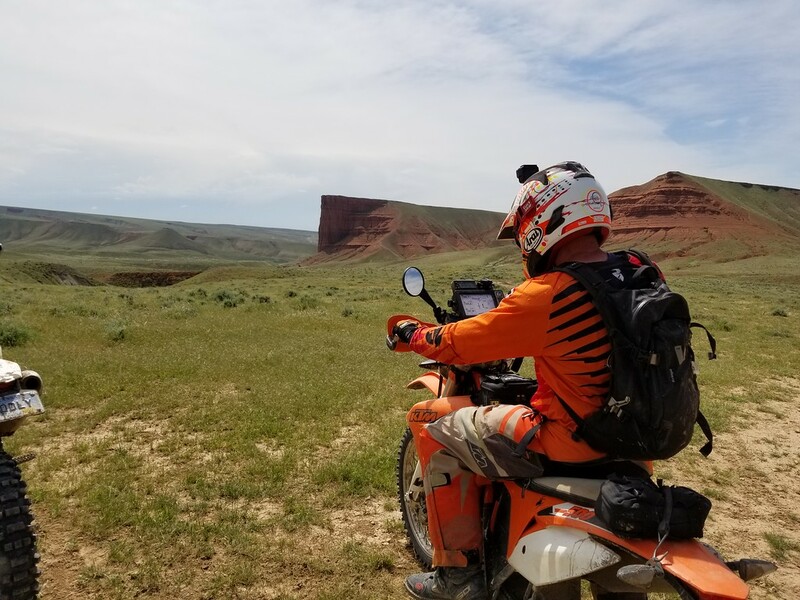 Then west through oil fields/pasture which was my favorite part of the ride, and I think many even the old timers and well traveled have not seen and across the head of the North fork of the Verdegris. Back on route to Teeter Rock on township Rd 50 we have the traditional stop and photo shoot at Teeterville. 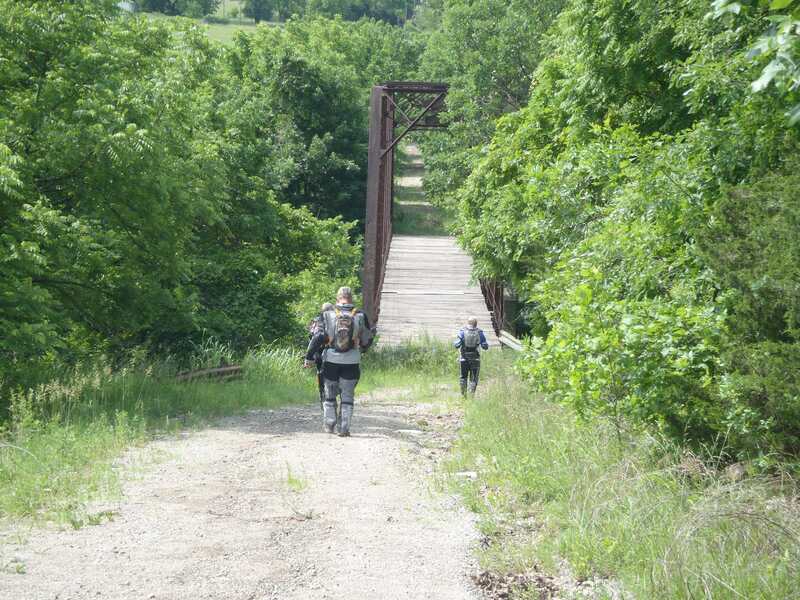 Re track to Texico Hill and take Madison Road to the Chase Co line the North to Camp Creek. 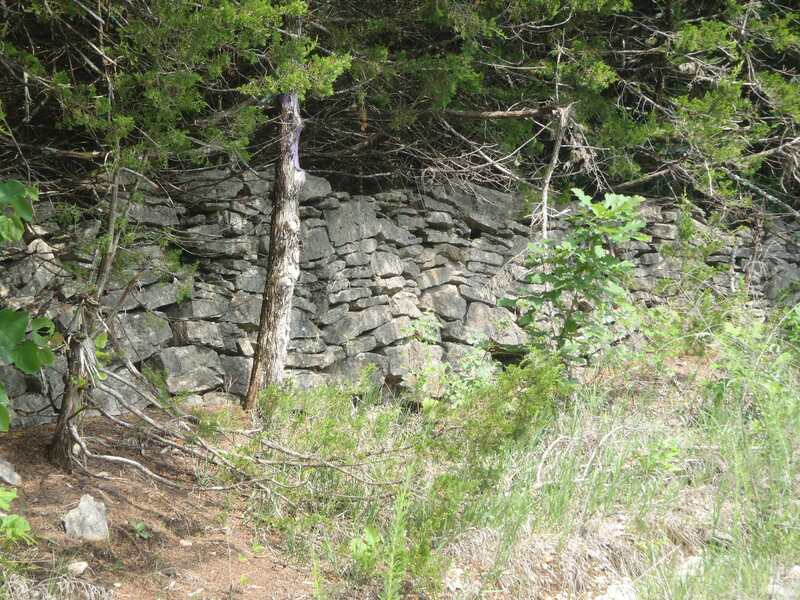 This is where I got froggy and thought just because I can, I am going up the side of Texico Hill. It was right before the Y in the road and I hope if any didn't want to follow, they would see we were just here and stay on the road. Not sure who all took it but when I got to the top there was a gent out taking photos and he seemed a bit in awe. I think some must have stopped to chat with the guy cuz that was one hiccup. Regrouped and pushed on. We encountered some bicyclist on Madison Rd and before we got to Camp Creek Rd had a bit of separation. I "think" my sweep is such a kind heart that he stopped to help a fellow two wheeler out with a blown tire. God Bless that man! 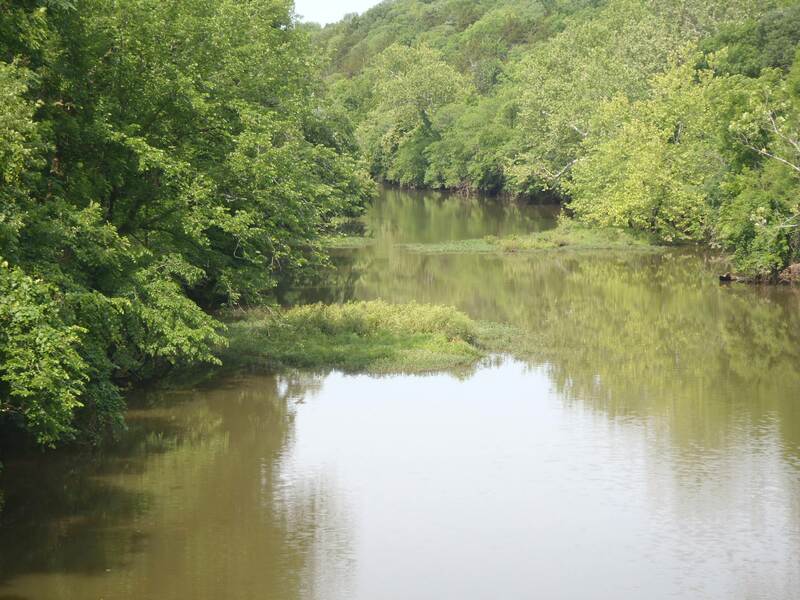 The crossing at Camp creek is where it Merges with the North fork of the Vedegris. After crossing Camp Creek north through Nation Ranch to Bazaar Cattle pens where we encountered a closed gate....Closer look and it is just hooked, make sure we get it closed, (Thanks Phil ) and continue on North to Hwy 50 across the Cottonwood River, and on to Americus for lunch at Rolling HIlls Bar and Grill. They looked to be about half full but did have plenty of seating for us even if not organized. Tables seemed to get served as a group so food was a bit slow coming but with now 18 of us as Benson joined us...the food I hope was great, I heard no complaints. Marc and Derek split off as they had a long ride home still. We left Americus heading west to Dunlap, where Dow peeled off to go home to Alma, crossed the Neosho River 3 times, then back south to a Rd north of Kahola Lake Greg calls the roller coaster, back around to Kahola Lake to see the Bald Eagles and around the lake back south across the damn. Enjoyed your ride report ...fun day. 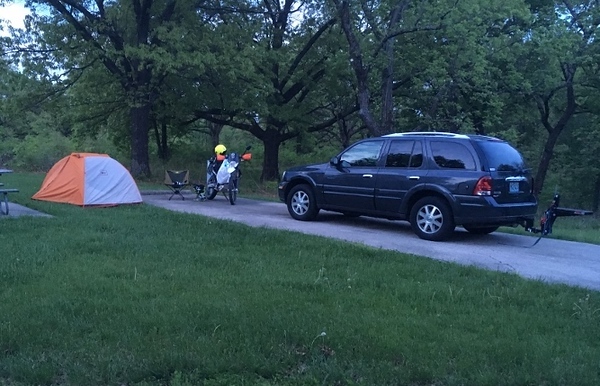 Did some car camping this weekend at John Pershing State Park. 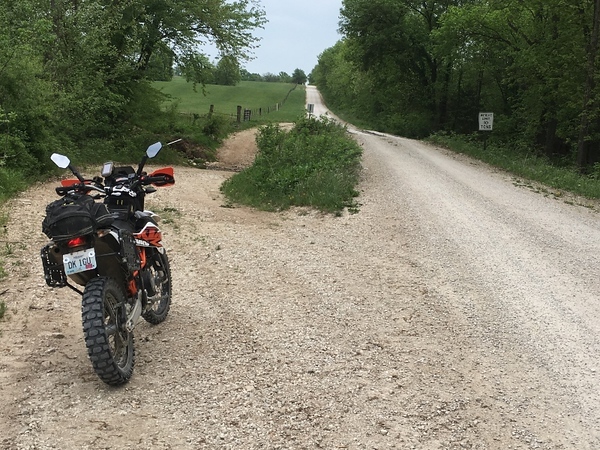 I was working on a track connecting John Pershing State Park to Graham Cave State Park. Interesting how they filled in so much of the creek with gravel to build supports for the bridge. Off to the left they used shipping containers as drain pipes. 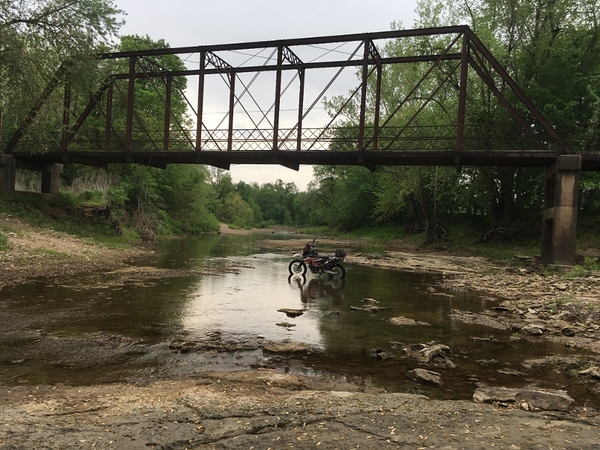 A number of these old structures aren't wide enough or strong enough for today's farming equipment to utilize the bridges, which is the real reason for the water crossings. Made the trek in about 6 hours. Total trip From Pershing State Park to Graham Cave State Park and back was 10.5 hours and 441 miles. The trip back was mostly asphalt and higher speeds obviously. 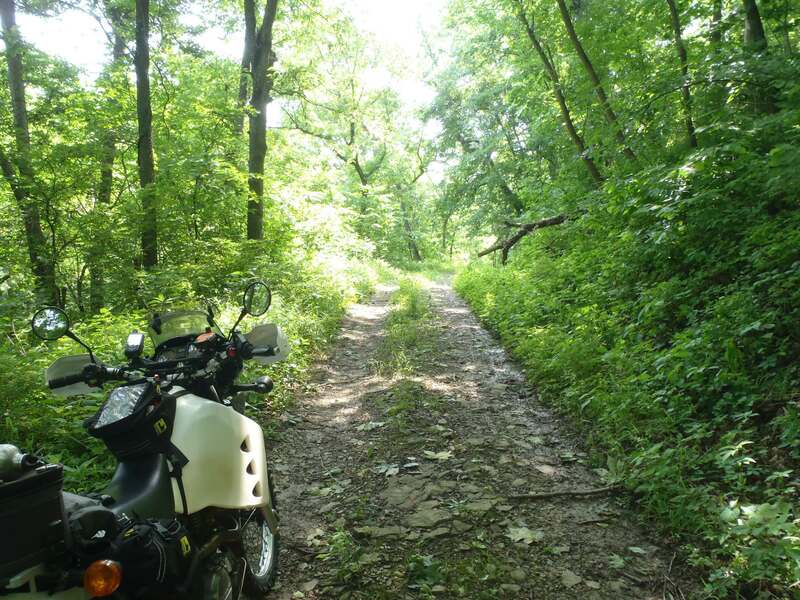 Next weekend I will be camping at Graham Cave State Park riding a track from there to down near Truman State Park. I'll be hitting Manassass Creek road and a number of other ones on the trip. Nice!! 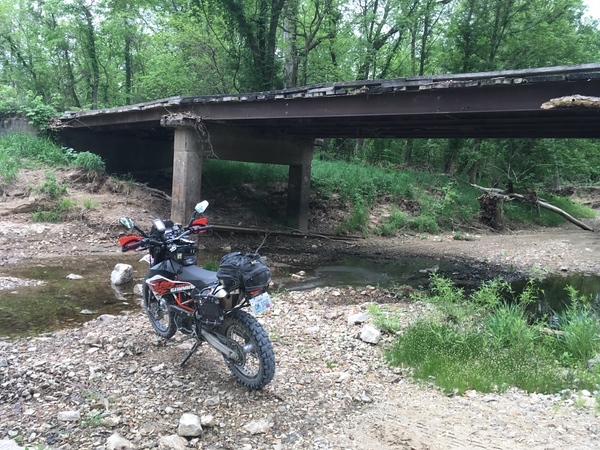 I was wondering why there would a bridge and a creek crossing. 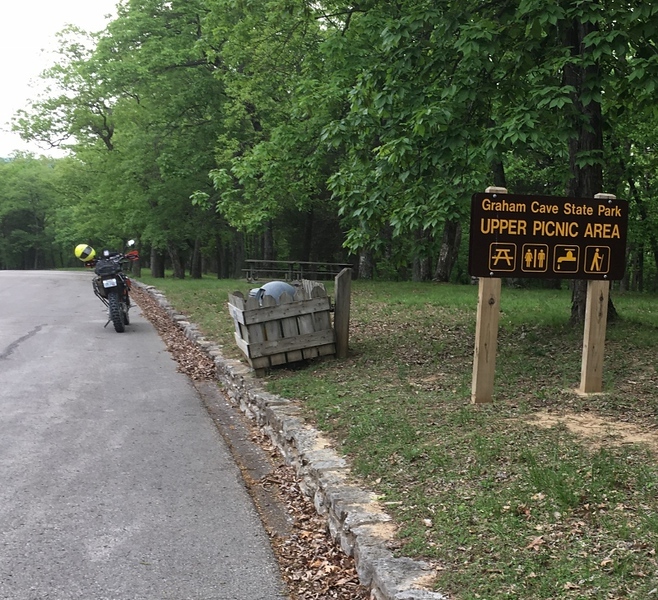 I don't have any pics, but my brother, a friend, and I enjoyed 3 days of riding and camping in NW Arkansas out of the Mulberry Mountain Lodge campground on the Hwy 23 Pig Trail. 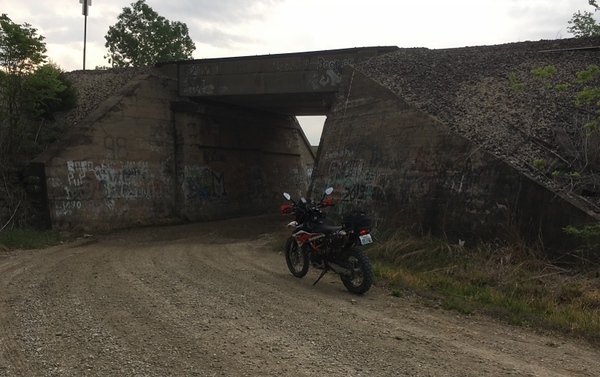 PERFECT camping weather and some really great exploration on long-forgotten "roads". Unfortunately, they have almost destroyed the Mill Creek ATV system. First, the trails are now wide enough for my truck easily. Second, the have installed the most ridiculously tall and narrow water berms I've ever seen. The longer ATVs and the Side by Sides report they high-center on them. On a motorcycle, they are simply exhausting and prevent you from carrying any decent speed. You'd have to be a supercross champion to actually jump them as they are VERY vertical--some with 6ft near drop-offs awaiting you on the other side. 2 or 3 AR rides in the area every year since 2006--only ever saw a black bear once...until this weekend. We saw black bear both Friday and Saturday. And not just bears...while approaching one of about a dozen Indian Creek crossings on a seldom traveled trail, I stopped with my front wheel at the lip of a small rock ledge to survey my crossing plan. 2 feet ahead of my front wheel and slightly to my right was an almost 3' fat cotton mouth coiled, stood up and mouth open spitting mad and ready to strike. Good times. 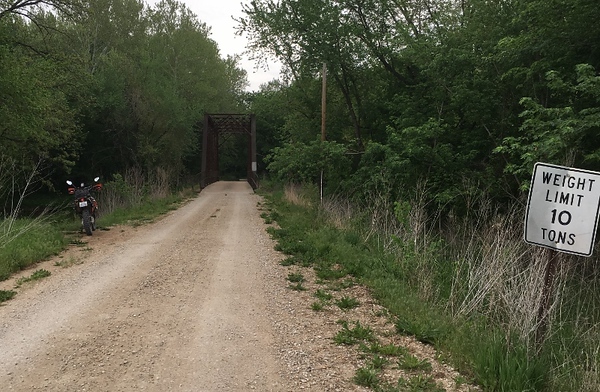 Later that day, Matt, while riding sweep on a gravel road at about 25 MPH, saw a small doe heading for a collision course with his handlebars on the left side. He started slowing and actually kicked the deer to prevent impact. He was able to slow down more and the deer shot across the front wheel. All lived to tell the tale! What a great weekend! 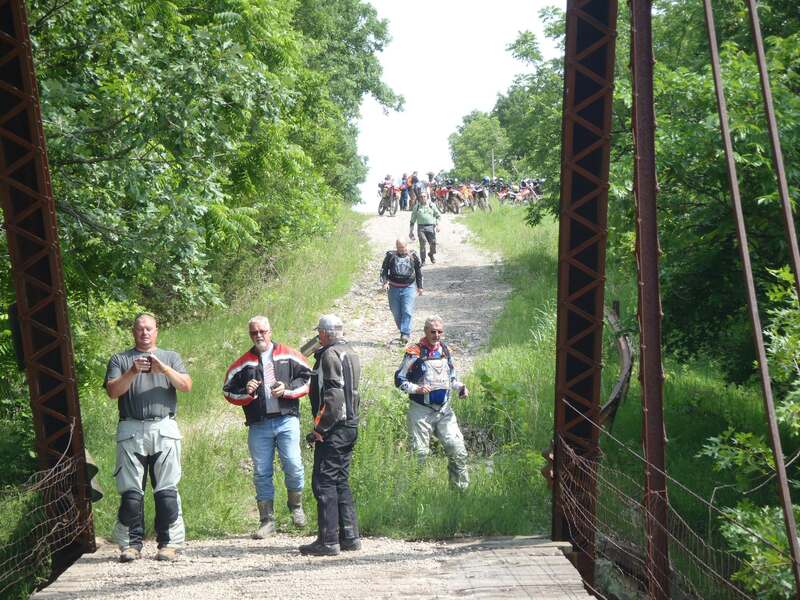 Glad to hear about so many folks out riding! How is the 500 treating Kyle? It is probably impossible to keep up with in anymore now! Hard to say because it was hard to see him back there in my dust. I never seen you go fast enough to raise dust. That is a good one Eddie! 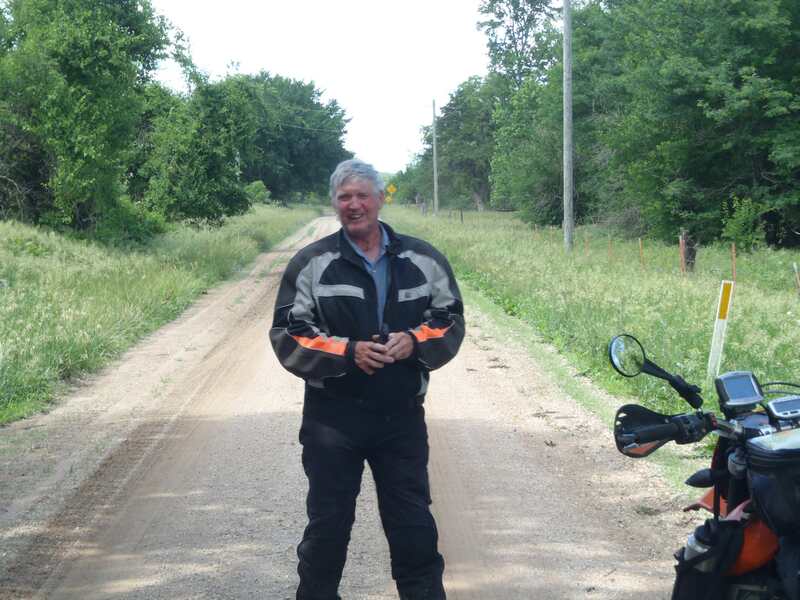 On Wed, May 16, Birdman and I attempted his Linn County dualsport route created with input also from ajayhawkfan. I say "attempted" because we were not able to complete it. 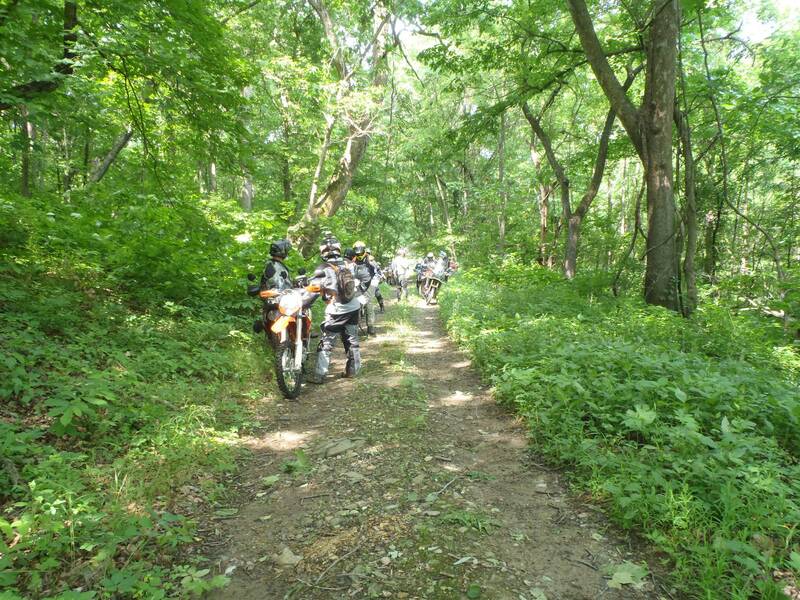 First, it is too long for a normal dualsport group. Second, my flat rear tire revealed a completely destroyed wheel bearing when the balls fell out of the hub as I removed the wheel. HUGE THANKS to safiri for making the 2+ hour round-trip to rescue me! Thanks also to birdman for leading me around and staying with me until I was rescued. He had cell reception (Verizon), and I did not (Republic Wireless on Sprint). Awesome pics! Looks like a great area to ride! Glad I was available to help out. Was a pretty drive once I got out of the city. 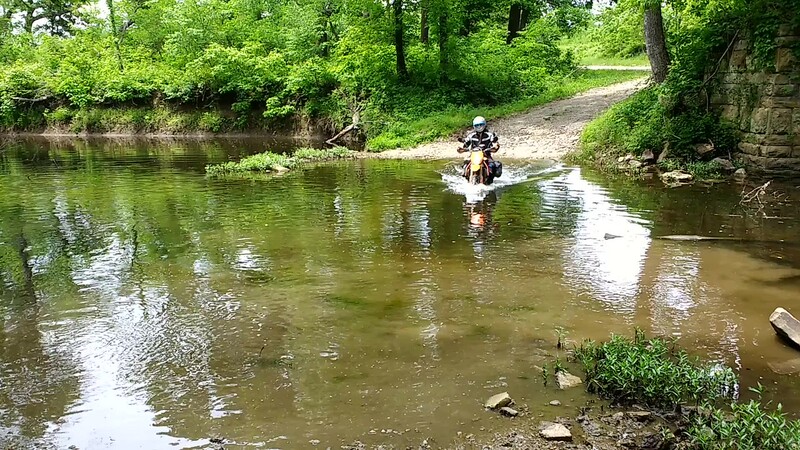 Is photo 13 where Luc nearly submerged his big bike (and did submerge himself)? Yes it is where Luc hooked his foot peg on a log that tipped him in the drink. Thanks Troy for ridding with me. 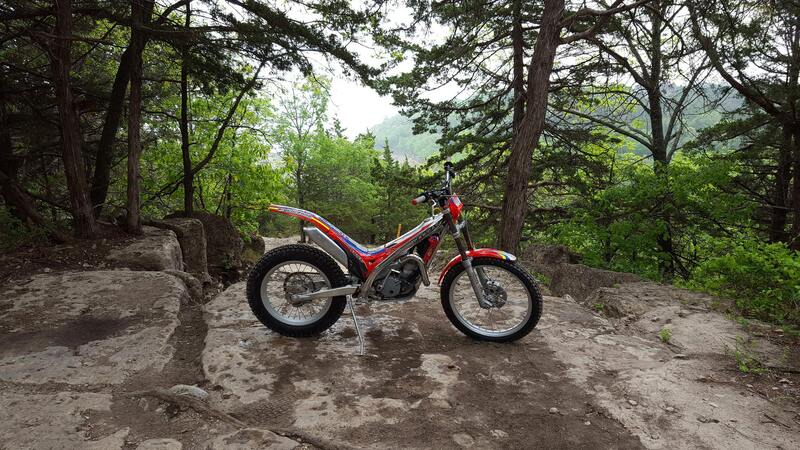 I will shorten the ride and have to ride it again , will need someone to ride with me, any volunteers'. Hope to do it next week. Lots of those pictures look very familiar to me. Those crossing would be out of the questions today because of the weekends rain. 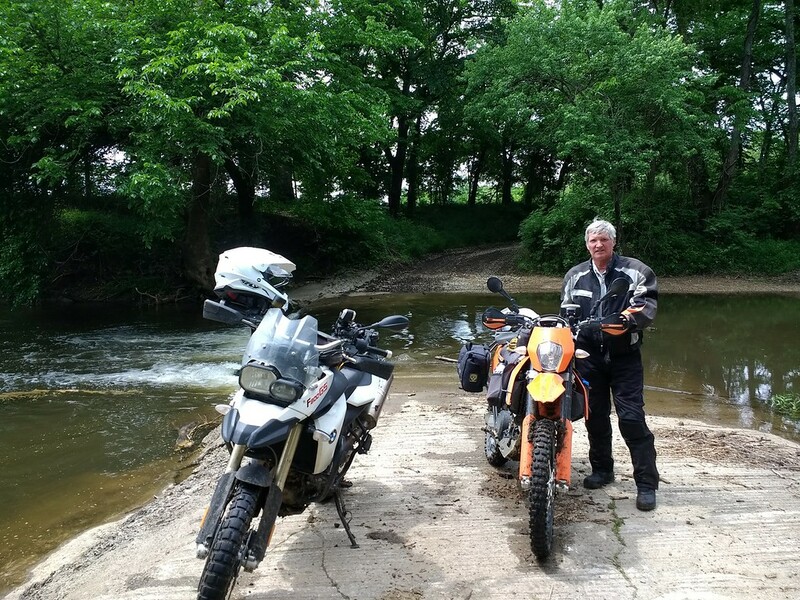 Dual Sport Safari 2018...Big THANKS Larry. Absolutely incredible track...more fun than most people should be allowed to have...…………………….